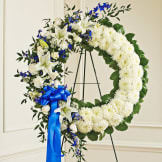 Beautiful blue and white flowers offer a comforting symbol of your heartfelt compassion and support. 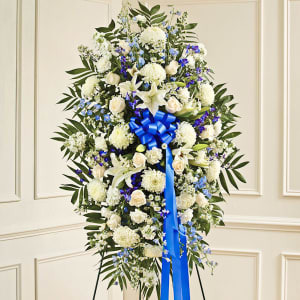 Flowers will be received by a Smith-Peoples Funeral Home's staff. The flower arrangement was beautiful. It recieved many compliments at the memorial service for my brother. It was a wonderful way to say "we all loved you" to my beloved brother, Kenny. Thank you so much for the beautiful flowers. 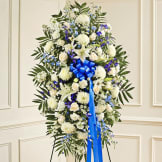 All of our flowers are designed and delivered by hand from a local florist in in Augusta.